NO Turkey on the menu for this screening! 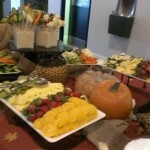 The buffet for Relativity Media guests offered up fresh salads, crudite on bamboo, a luscious fruit platter, sweet corn cakes with anaheim chiles and guacamole, yummy cupcakes, caramel apples and fun movie candy treats! 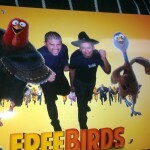 Chef Mariano and staff member Rudolfo joined in on the Free Birds fun in this great pic! Can't wait to see this movie with the kids! In theaters tomorrow, November 1st, starring Woody Harrelson and Owen Wilson, this animated film is about "...two turkeys from opposite sides of the tracks must put aside their differences and team up to travel back in time to change the course of history - and get turkey off the holiday menu for good." follow the link below to go to the Free Birds official webpage to learn about the characters, see clips & more! !